* Anomalistic – the length of time it takes the moon to circle the Earth, measured from one perigee (the closest point in its orbit to Earth) to the next: 27 days, 13 hours, 18 minutes, 37.4 seconds. 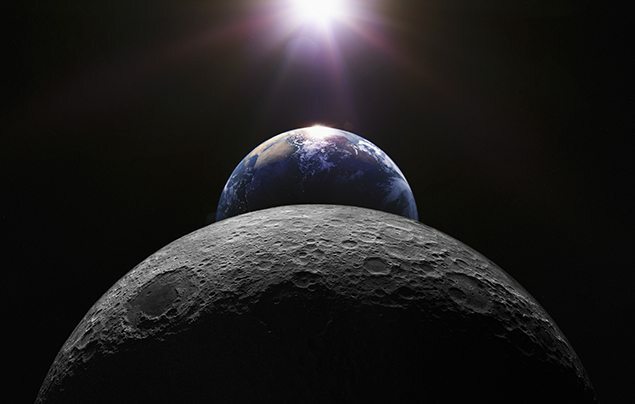 * Nodical – the length of time it takes the moon to pass through one of its nodes (where it crosses the plane of the Earth's orbit) and return to it: 27 days, 5 hours, 5 minutes, 35.9 seconds. * Sidereal – the length of time it takes the moon to circle the Earth, using the stars as a reference point: 27 days, 7 hours, 43 minutes, 11.5 seconds. * Synodical – the length of time it takes the moon to circle the Earth, using the sun as the reference point (that is, the time lapse between two successive conjunctions with the sun – going from new moon to new moon): 29 days, 12 hours, 44 minutes, 2.7 seconds. It is the synodic month that is the basis of many calendars today and is used to divide the year. If the moon's surface were like a perfectly smooth billiard ball, its surface brightness would be the same all over. In such a case, it would indeed appear half as bright. But the moon has a very rough topography. Especially near and along the day/night line (known as the terminator), the lunar landscape appears riddled with innumerable shadows cast by mountains, boulders and even tiny grains of lunar dust. Also, the moon's face is splotched with dark regions. The end result is that at first quarter, the moon appears only one eleventh as bright as when it's full.